PST Recovery tool recover complete Outlook data file including Email, Contacts, Tasks etc. Not only this tool recover existing Outlook data items but also recover all permanently deleted data files. Using PST Recovery tool you can repair Outlook PST file then you can save this recovered Outlook data file into PST and other two most commonly used file formats. Software also allows to save large PST file into smaller ones. Outlook Data Recovery Software support selective export of PST data items by selecting the desired file or folder to be exported. By default software will export all folder/folders, you can uncheck the unnecessary things accordingly. Recover PST File software will produce an immediate preview of all Emails and other data items of PST file using implicit viewer utility of software. You can able to view all attachments and Meta data from this preview. Extraordinary feature of Outlook PST recovery software is that it can recover PST file even if it is corrupted due to compression, virus attack or oversized PST file. This software also able to recover password protected & encrypted PST files. Recover PST file using this software as well as maintain original PST hierarchy or folder structure. Software ensure to save all attachment associated with mails and Meta data (Cc, Bcc, From, To, Subject) as original as in initial PST file. MS Outlook is the most widely used desktop based email client which use PST file format for storing its data file. These files are created in Outlook for Windows application are located in user’s local system. The type of data stored in PST files are emails, contacts, calendar, journals, tasks etc. The point of creating PST files is that these there will be no size limit issues on mail server. Also archived PST files proves to be very productive in case of data loss. Why to Recover PST file? MS Outlook crashes on startup and due to which Outlook PST files are crashed. And this issue can be frequently caused after first encounter. 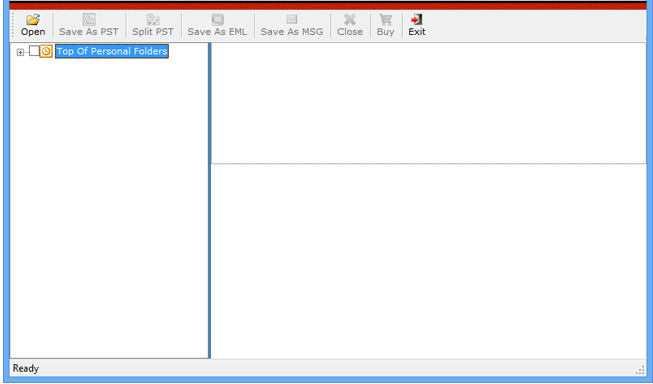 “MS Outlook file cannot be opened” error also occurs when the PST file is corrupted. There are also some chances that due to corruption some of files may got compromised. But using a PST recovery tool, even the permanently lost files can be restored. Outlook File Access is Denied issue is also experienced when the file is damaged and needs recovery. When the Outlook is not closed properly or if there is some virus attach can lead to PST File is in Use and Cannot be Accessed error. Repair PST file is only way to gain accessibility. Step 1: Launch the Software and open the PST file. Step 2: Scanning and recovery process will begins. Step 3: View complete structure of recovered PST file. 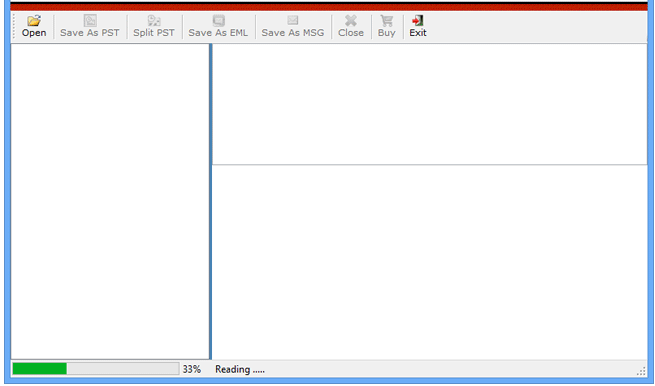 Step 4: Export the recovered PST file into different format. This video is provided here for our user to get an easy understating of software working procedure. Play video and follow the steps guided in it to Recover PST file easily. Do I need to have MS Outlook installed on my system to recover PST file ? Yes. Your system must have MS Outlook installed to recover PSR file and MS Outlook must be configured properly with one of the mail account. Can I recover PST using this software on latest version of Windows? Yes. PST recovery tool is not having any compatibility issue with any version of Windows. Do I recover any sized PST file using Outlook PST recovery tool? Yes. This PST recovery tool doesn't impose any file size limit on PST file. Does this software recover both ANSI and UNICODE format PST files? Yes. This software has the capability to recover both ANSI and UNICODE PST file format. Is this software recover deleted data item? Yes. Using repair PST tool you can recovered all your permanently deleted emails, contacts and other data item successfully. Does this tool recover highly corrupted PST file? Yes. You can easily recover highly corrupted PST file from PST recovery tool that is not recovered by executing scanpst.exe inbuilt utility. 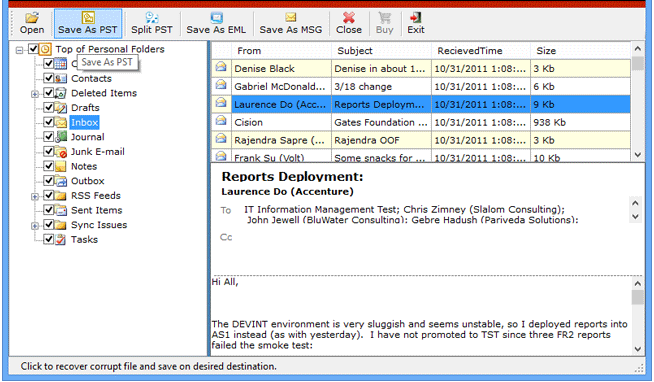 Support MS Outlook version 2013, 2010, 2007, 2003, 2000 (32/64 bit- Any Version of MS Outlook). Microsoft Windows are supported by Recover PST software including Windows 10, 8.1,8, 7, Vista, XP, 2008, 2005, ME, & NT (Any Version of Microsoft Windows). 20 MB of free hard disk space should be available to run Repair PST software. 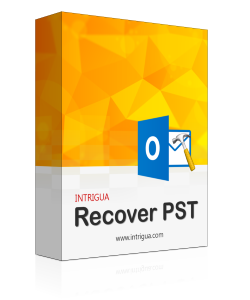 According to my personal experience with Intrigua Recover PST File software, I must say it works efficiently and it's an incredible tool which will let us recover all deleted and corrupted emails from outlook data file. 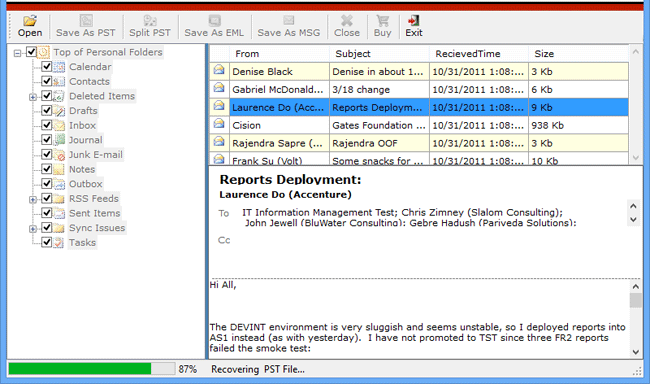 PST Recovery software has solved my big problem of recovering important email of our organization. I had tried all manual procedures to recover PST, but I failed to get that important emails. Then I found Recover PST tool and guess what all my issues were resolved easily.